Germany premium sanitaryware brand Sternhagen has launched a new range of contemporary and persuasive composite 3D wall tiles. According to the company, the new range has been designed to offer a mix of luxury materials and finishes with high-style and quality. Sternhagen is part of the Bhavnagar-based Acrysil Group, which has pioneered composite kitchen sinks in India. 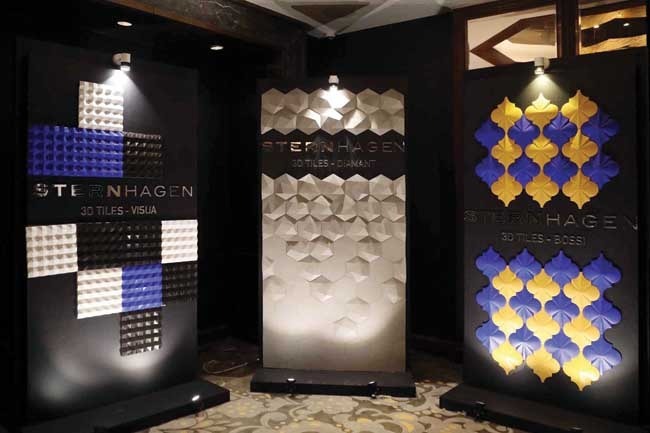 The 3D composite tile collection offers six design concepts – Glam, Diamant, Bossi, Spark, Hexy, Visua – which are available at Sternhagen’s flagship stores as well as at dealer outlets across India. These tiles are available in nine shades – papaya, klein, carib, avacado, curcuma along with white, black, grey and cream. Speaking exclusively to Sourcing Hardware, Parekh shared that these 3D quartz and concrete wall tiles have been designed by Hungarian designers. “The price range, `300–700 per sft, is competitive as well as affordable,” he remarked, adding that the flat tiles are 30% cheaper than 3D tiles. The initial plan for the coming two years is to produce 10,000sft, and then gradually increase production capacity to 100,000sft. “We will continue to focus on design, quality and affordable price,” Parekh said. Emphasising the importance of installation, he averred that if installation is not done properly, having a good product on the wall is of no value. The tiles will also be launched in US and UK markets in the coming months. G Nandkumar of Dyanmic Marketing, who is Sternhagen’s business partner for Chennai region, concurs that quality and design of Sternhagen products, combined with affordable pricing, is giving the brand a competitive edge in the market. “The 3D composite wall tile will find many takers owing to its design and price. I foresee good volumes in Chennai,” he told Sourcing Hardware at the launch. Leading dealers from Chandigarh and Kolkata expressed similar views. Malay Pandya, technical head at the company, explained the composition and other details of the tiles. “The tiles are made of composite quartz material, ie a mix of quartz, minerals and concrete. We conduct training programmes wherein the focus is on laying of tiles. Training is imparted on the use of cement-based adhesives, polymer-based adhesives, etc. We go to the extent of educating installers and sellers how to clean the tiles, use water and moist cloth to clean, and never use detergent, etc,” he informed, adding that the finer nuances of laying of tiles makes all the difference. “3D effect is the USP of our product,” Pandya remarked, adding that the ‘rises and valley’ are irreplaceable. He shared that currently the focus is on interiors, and going forward exterior application would be placed on the radar.